In the annals of American film, no name shines more brightly than that of John Ford. Director and filmmaker for more than a half a century, he stands pre-eminent in his craft -- not only as a creator of individual films of surpassing excellence, but as a master among those who transformed the early motion pictures into a compelling new art form that developed in America and swept the world. As an interpreter of the Nation's heritage, he left his personal stamp indelibly printed on the consciousness of whole generations both here and abroad. In his life and in his work, John Ford represents the best in American films and the best in America. 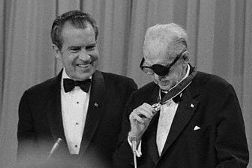 Thus spoke the commendation that accompanied the Presidential Medal of Freedom awarded to John Ford in 1973. 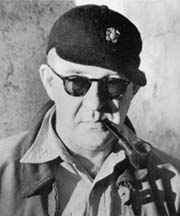 However, John Ford was also one of Hollywood's most demanding and irascible directors. Many in the film industry considered him cruel and sadistic, and refused to have anything to do with him, but even his worst critics will admit that he was the preeminent director of Westerns. Ford guided the evolution of the Western from a black hats versus white hats stereotype into a quintessential American story. During a career that spanned over 50 years and 200 films, he won seven Oscars; four for directing, one for best picture and two for best documentary. His real name was Sean Aloysius Feeney, and he was born in Maine in 1895, the youngest of 13 children of Irish immigrants. He went to Hollywood at the age of 16, following after his brother who had gone 10 years earlier and become a successful actor and director. John began as an assistant to his older brother and later worked as a stuntman and actor before becoming a director. He directed his first feature film for Universal in 1917. It was a Western called Straight Shooting and many more Westerns were to follow. Most films of the era used flat lighting and mundane settings, but Ford was heavily influenced by the Germanic style of filmmaking of the 1920’s which pioneered the use of artistic light and shadow. Ford shot most of the exteriors for his Westerns in Monument Valley; located in Arizona and Utah, and with that backdrop his great skill for composing striking visuals was immediately apparent. He also emphasized character development in a genre where one-dimensional characters were the norm. Ford soon became known as the top director of Westerns. He was always on the lookout for new talent and at Fox Studios he discovered a prop boy named Marion Michael Morrison, who had been a football player at USC. Ford saw something in Morrison and wanted to cast him in the lead for his next film, called Stagecoach. After a long battle with studio executives over using an unknown, Ford got his way and cast him in the lead under the name John Wayne. Stagecoach is still regarded as one of the best Westerns ever made and the film made John Wayne a star. John Ford was very tough with his actors, often ridiculing them endlessly, and that was if he liked them. Being ignored by Ford was even worse because that meant he probably wouldn’t work with you again. During the filming of Stagecoach, Ford constantly ridiculed John Wayne; telling him he was a bad actor, and made fun of the way he walked and talked, till finally the other actors came to Wayne’s defense and told Ford to lay off. Later Ford revealed that he had intentionally created that problem so that the experienced actors on the set, who would normally be jealous of a newcomer in a starring role, would defend Wayne. Ford’s mistreatment of Wayne didn’t end with Stagecoach. They made many films together and Ford taunted Wayne constantly during the filming of all of them. Ford treated all of his favorite actors that way and on several occasions an actor got fed up and challenged Ford to a fistfight. During World War II, Ford joined the Navy and made several documentaries, including two he won Oscars for; The Battle of Midway and December 7th. He retired from the service as a Rear Admiral. After the war, Ford’s confrontational methods finally backfired on him during the filming of Mister Roberts, starring Henry Fonda, who had also starred in the stage version. Fonda had worked with Ford many times before, most notably on The Grapes of Wrath and had bristled at Ford’s mistreatment in the past. This time Fonda had more clout with the studio heads and refused to put up with Ford’s abusive comments. Ford wouldn’t compromise, so Fonda had him replaced as director with Mervyn LeRoy. Ford actively participated in the witch-hunting in the entertainment industry during the McCarthy era of the 1950’s when anyone suspected of being a communist was blacklisted. He was part of an attempted take-over of the Director’s Guild of America by legendary director Cecil B. De Mille who believed that the Guild was being run by communists, but Ford became so appalled by De Mille’s red-baiting tactics, that he publicly broke with him during a Guild meeting saying, I don’t like you and I don’t like what has been happening here tonight." Ford then called for a vote on retaining the current leadership. The vote passed and De Mille’s challenge was defeated. Though he is probably best known for his Westerns, like My Darling Clementine (1946), and the cavalry trilogy of Fort Apache (1948), She Wore a Yellow Ribbon (1949), and Rio Grande (1950), John Ford directed many other types of films that were very successful and lauded by the critics. Some of his best known works are The Lost Patrol (1934), Young Mr. Lincoln (1939), The Grapes of Wrath (1940), How Green Was My Valley (1941), and The Quiet Man (1952). Ford was concerned about racial prejudice and sought to raise awareness of the problem in films such as The Searchers (1956), Sergeant Rutledge (1960), Donovan's Reef (1963), and Cheyenne Autumn (1964). His last feature film was 7 Women (1966), a critical and box-office disappointment that many critics thought was a throwback to Ford’s 1930’s techniques. There was talk that he had "lost it" and didn’t know how to direct a film any more. Stung by the criticism and plagued by ill health, Ford decided to retire. In 1973, he was award the American Film Institute’s first ever Life Time Achievement Award as well as the Presidential Medal of Freedom a few months before he died of cancer.